Chinewalk: by Todd Morgan Perhaps a little history lesson is in order before proceeding. My first true hi performance bassboat was a 20' tunnel hull Shadow. It was initially rigged with a 200 GT Johnson but was later revamped with a 2.4 Bridgeport. Driving this boat was straightforward with only a very strong grip to counter torque being necessary. My next boat was a custom 18' Shadow weighing 700 lbs and also equipped with a 2.4 carb Bridgeport. This is the point where driving became interesting. I did fish a little back in those days, so I rigged the boat as most of your boats are rigged, i.e., 2 trolling batteries, 1 cranking battery, the internal trim pump for the 2.4 and all my fishing gear scattered throughout the boat. I knew the Vee would be a different animal altogether, but I never envisioned the difficulties to come. This boat also had a great deal of steering torque, but now "driving" the boat was lumped on top of the torque control. I was a svelte 230 lbs back in those days and the combination of gear location along with battery layout caused the boat to list badly to the driver's side during hi speed runs. This caused the boat to become uncontrollable at 70+ mph. It was at this time of blistered hands that I met Tom Eissen from Knoxville, Tenn. Tom is a prop guy who really specialized in OMC / Norriscraft stuff. One look at the setup and he decided the cable steering was far too loose and the balance was all wrong. We tightened the steering, added weight to the passenger side to counteract the driver's weight and redistributed the fishing load so as to help in the balance also. These few items made the boat totally different to drive. The final setup had 2 batteries (cranking & trolling) on the passenger side along with about 50 lbs of lead diver's weights as ballast. The boat was 90 mph capable with the 2.4 and at a later date received a super modified Mod VP that pushed it past 100 mph with a 30" Spinelli prop. With that established, the method of controlling chinewalk is two-fold. 1. The initial setup of the boat is extremely important. Engine height, weight distribution, prop selection, lower unit and even engine selection can have an impact on the final outcome of a setup problem. 2. Driver input. There is far more to operating a performance boat than holding the wheel in a steady position. The amount of steering input is very important here. Too much will cause loss of control and too little will do the same. Causes of chine are many; cures are few! In my opinion, all high performance hulls will chinewalk. Triton is a boat that stands at the forefront of the debate, so we will use that platform for a basis for chine cure. Without getting into my very limited knowledge of design, Triton is a boat that requires less angle of attack than other brands. The biggest cause of ill handling Tritons I have seen is over trimming the hull to obtain a nose high attitude. Engine height on the transom is also crucial. While history dictates lowering the engine to regain driving ease, Triton is exactly the opposite. The highest possible setting that avoids low water pressure or prop venting is what's desired here. Brand X may require lowering instead of raising, my point being that there is a "sweet spot" that can be attained. One of the simplest ways to determine final setup is to observe a craft that operates correctly and copy his setup. Weight distribution is a simple, yet effective way to help manage chine control. If you're fishing single, keep all the heavy things in the boat on the passenger side. Keep the lifejackets and rainsuits on the driver's side. Also keep the heavy items out of the bow storage boxes. This will allow for greater bow lift with much less trim. Prop selection can also have a great effect on control due to transom lift, steering torque and water holding capability. In general, a 4 blade is better for all around performance, but in my opinion a 3 blade is a better choice for new owners/drivers due to the lack of transom lift. To put it simply, the more boat in the water, the less chine there will be. The negative is that speed will be less also. The whole basis for chine is that the hull is lifting to the point that it has to be balanced on the pad and lifting strakes; this only occurs as the hull reaches it maximum potential. The idea that Ranger, Champion or other well respected heavy performance hulls are beyond chining is just not so. These hulls, given the maximum setup to achieve their fullest potential will chine also. Seat time is part of what's necessary to get your nice new shiny rig to perform the way the salesman or mechanic drove it during your demo ride. There are some other things that will help, like balance, prop, load placement, etc.....But all in all, time is what's needed here. My advice to problem chiners is to leave the rods at home and just go drive. The series of steering inputs to control the chine oscillation have to be done in a timely fashion in the opposite direction of the bow movement. When the bow moves left, steer right. When the bow moves right, steer left. All this is done rapidly and in short jerky motions. The only way to master the series of steering inputs is to become accustomed to doing it yourself, in your own boat! When getting accustomed to chine control, use a very limited amount of trim setting for that speed and attitude. The result of over trimming is, as I said, "the leading cause of uncontrollable chine". I'm a firm believer that chinewalk is not to be "driven through". It is to be prevented with the setup and steering inputs before it happens, once chine begins the driver must quell it immediately or lower the trim setting and reduce speed to regain control. With that being shown, think about this: If you move the charger alone, not only do you add 20 needed pounds to the passenger side, you remove 20 unneeded pounds from the driver's side. A total movement of 40 lbs. Now, move the oil tank as far to the port side as possible, neutralizing the 15 lbs and you have made a great step towards controlling the seemingly uncontrollable. Use your standard fishing load to adjust the rest of the weight accordingly. The hull may accomodate some of the offset when your partner is with you, maybe not at all. If needed, move gear from port to starboard to counter a heavier load than usual on the passenger side. As I'm sure you have discerned by now, I'm no writer. What I am is a fisherman who has had the privilege to work with dealers and other fishermen on curing the ills of high performance bassboats. I have been where you are now, wondering if my boat will ever be drivable. The answer is Yes! With time and input from other drivers who have braved what you are experiencing, seat time on your own part, and setup tips and advice from those in the "know", you will be successful! I am available online for any questions you might have. Can it be cured? Chinewalk happens when the boat has the ability to run with little wetted surface. The boat is trying to run on a small pad, once it falls off this pad, it falls to one side then bounces over to the other side. Hence chinewalking! If you own a boat that chinewalks, first look at your setup. Make sure that you have NO slack in your steering; this will promote chinewalk. Look at your jackplate - is it of good design? Is it cross braced well? A poorly made jackplate will flex, promoting chinewalk. If you are running an older motor, take a look at the rubber motor mounts; they wear with time, again promoting chinewalk. The loading of weight also plays a big role. While sitting in the water while you are in the driver's seat, have a buddy look and see if your boat sits level at rest. If it does not, move weight around until it does. My best tip on chinewalk is: CONTROL IT BEFORE IT HAPPENS! That sounds silly, I know. It's like riding a bike; how do you tell someone how to keep his or her balance? Here is what helped me learn to drive a 2.4 200 HP XB2002 Allison. It had every setup problem that I listed above, but this is how I learned. Drive your boat 5 mph under where it starts walking with little trim. Increase your speed by 5 mph or so. As speed increases you will feel the bow want to push into the water - this is where you want to bump the trim up to keep the nose from plowing. Play around with the trim at these speeds, once you're comfortable with it, increase your speed slightly and manipulate the trim accordingly. At some point the boat will start to feel light - it is climbing up on the pad. Once it starts feeling light it may want to chinewalk. If you hold the steering wheel in about a 1 or 2 degree sweeping corner, it will help balance the boat. The biggest mistake is jerking the steering wheel. It is more like a twitch! If the right side starts to fall, twitch it to the left. Over-steering will promote chinewalk. Drive around at these speeds and play with the trim. Once you are comfortable with it, increase your speed and adjust trim angle accordingly. DO NOT TRY TO DRIVE THROUGH CHINEWALK!! Get comfortable with it at a slower speed. It is true; once you have reached top speed the chinewalk will lessen. A major factor in chinewalk is the torque of the prop and motor. This is why it is important to increase speeds slowly and gradually. At top speed the torque will lessen because the motor/prop is no longer trying to gain speed, but just maintaining it. DO NOT OVERTRIM! I know it looks cool with the bow flying 3 feet out of the water, but let's think about it. Picture the front edge of the running pad as a fulcrum point of a teeter totter. The higher you trim the bow, the deeper the rear of the pad and gearcase go into the water. Not only are you promoting chinewalk, but you are also scrubbing off speed as well! 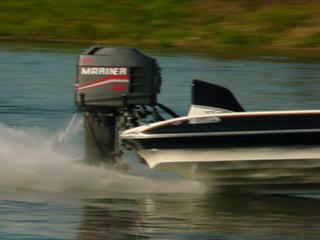 Going fast is fun, but you have to know how to turn, take boat wakes, and slow down too! You never hear advice about this. It is much more important than just going fast! This will apply more to Allisons and other lighter, faster boats. ALWAYS bump the trim down before you let off the gas! A couple of things are working against you when you come off the gas; when you suddenly let off the gas you will get torque steer on the steering wheel in the opposite direction that you get while accelerating. If the gas is suddenly let off, the bow may come down crooked into the water - you may experience bow hook in a very mild manner or one so severe that it can throw you or passengers from the boat! Trim the bow down, then ease off the throttle. By not doing so you are setting yourself up for a bow hook. This is a good practice for any boat that is capable of chinewalking! While crossing wakes, try to hit them straight on, trim down and let the "V" of the boat work for you. While cornering, also trim down and lose some speed. Going fast is fun only if you can do it safely, without putting anyone else at harm! Always wear your lifejacket and please, hook the kill switch up. In my opinion, a boat that is capable of walking NEEDS a foot throttle and tilt/trim on the wheel, so you will hever have to drive it with just one hand! Be safe. I am not a pro, or claim to be one, but if I can help you, I will try! CONTROL IT BEFORE IT HAPPENS !!! 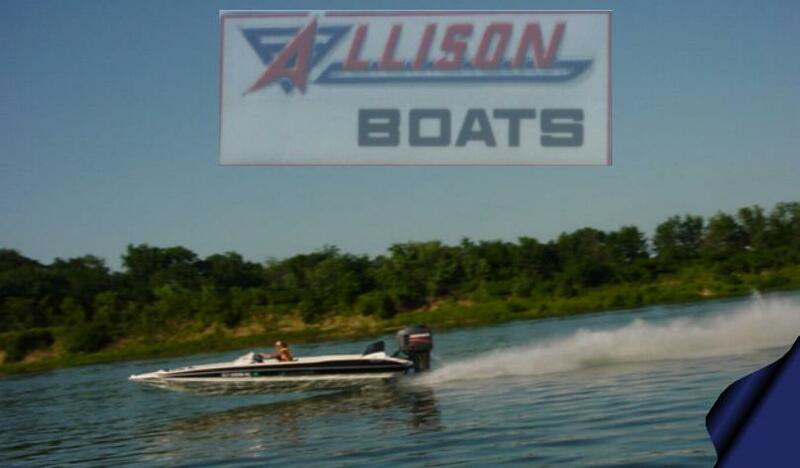 The first high performance boat I ever drove was a 17'9" Bullet with a 200 Merc that was kind of hopped up. It was a true 80 mph boat, and when the tach hit 6400 with that 28" Chopper, it really got squirrely. My brother, the owner, tried his best to tell me how to handle the "walk", but every time I tried it was the same. One summer, my brother went out of town and left the boat for me to use. "Be careful", he said. I started thinking of my first car driving experience on the Interstate and it dawned on me that my brother was trying to tell me to make small minute adjustments on the wheel instead of hard jerks like I had been trying. My trip to the lake later that afternoon was interesting.. When I made small left and right movements to the wheel, the boat stayed straight. I was able to get the boat all the way to 74 mph before I backed out. With more seat time I was revving the engine to its top rpm of 6400. That big chopper was sure hard to steer at those speeds, but I was not intimidated anymore. Now driving a high performance boat is like driving a car to me, even when the water is choppy. I believe that seat time is the most important ingredient to controlling chinewalk. A good way to test yourself is to go out on a weekday when there is less traffic. Start at a speed that let's you trim the motor up high enough to where the chinewalk is just starting. When you feel it starting to roll off to one side, put the boat in a slight left turn. When you do this it stabilizes the boat. After a while you get a feel of when the boat is going to start chining and with more seat time you will learn to handle any speeds. It's kind of like riding a bicycle; you cannot keep your balance by keeping the handlebars straight, you have to constantly move the bars to keep the bike upright. I hope this story helps someone, and remember - always wear your lifejacket and use your kill switch, it could save your life. Chine Walking: One of the biggest complaints of high performance boats - particularly V-bottoms - is that of the boat "chine walking". Chine walking occurs when the boat is running at high speed - usually at 65 mph or higher - and because of the size of the boat trying to run on very little hull, it will fall off to one side, then flop back to the other, etc., etc. There are many myths to chine walking, i.e., "A four blade prop will cure your chine walk". Unfortunately, that is not true. True, a properly set up boat will be easier to drive and may chine walk less than a poorly set up hull, but chine walking occurs due to the laws of physics. The true way to reduce or eliminate chine walking? Learn to drive the boat. Many dealers will sell you a boat cheap, then hand over the keys and send you on your way. You should expect the dealer to show you how to drive and handle your high performance boat. A tip to help eliminate your chine walking is this: Always keep the boat guessing. By just holding the steering wheel, you're going to allow the boat to get into a rhythn which will lead to chine walking. Start out by "tapping" the steering wheel to the left - against the torque. Then, as the boat begins to fall to the left, release the steering wheel from the torque and turn the wheel slightly to the right. As the boat begins to lean to the right, return the wheel to the left against the torque. Remember this - KEEP THE STEERING WHEEL MOVEMENTS SMALL. By oversteering, you could do more harm than good. Try to imagine standing on a 2'x 4' with a ball underneath it. As the board leans to the left, you have to shift your weight to the right in order to keep the board from hitting the floor. We offer high performance boat driving sessions that will teach you what you need to do in order to master that high performance V-bottom boat. E-mail us or call at (847) 838-0066 in order to set up some time.